17 December International Day of Action: What’s happening here? Scroll down for details of solidarity events on 17 Dec.
Download this poster as pdf file here. Next Friday, 16 December, Bradley Manning’s pre-trial ‘Article 32′ hearing will start in Maryland, USA and is expected to last several days. Bradley Manning has been held for 18 months without trial, for approximately nine of those months under conditions of torture: extra-judicial punishment for allegedly speaking the truth about US wars and very likely with the (unsuccessful) aim of persuading him to implicate Julian Assange. Obama’s rhetoric is that whistle-blowers should be protected and respected. When campaigning in 2008, he said that whistleblowers’ “acts of courage and patriotism, which can sometimes save lives and often save taxpayer dollars, should be encouraged rather than stifled.” The reality, of course, is very different. 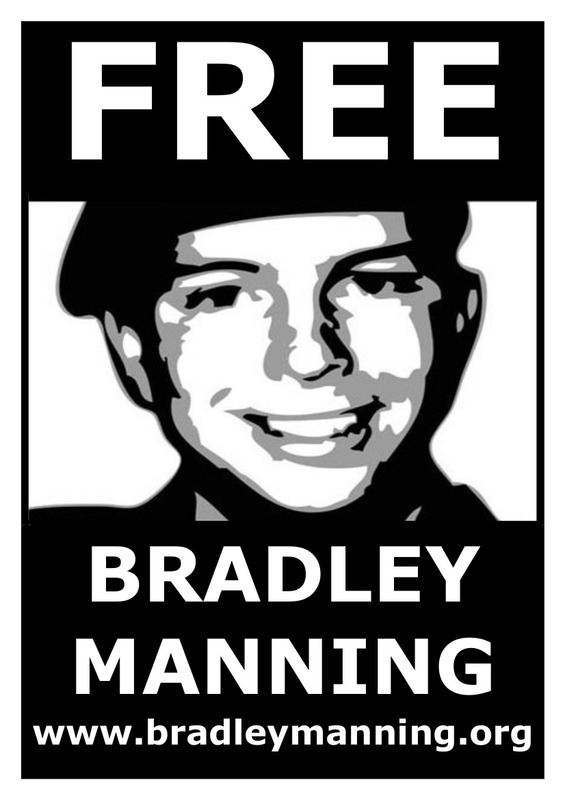 Bradley Manning’s defence team has called Barack Obama as one of nearly 50 witnesses at this first hearing, apparently in connection with comments Obama made to a Manning supporter at a fundraising event in which he declared Bradley Manning guilty, prejudicing Manning’s treatment and chances of a fair hearing. The US government is so far opposing all but the witnesses it also wishes to call which – no surprise – don’t include Obama. Meanwhile, the Senate has this month passed a law that anyone, American or not, military or civilian, can now be detained by the US military indefinitely without trial, a move that Britain may well be eager to copy. As Ralph Lopez says We are all Bradley Manning now, at least potentially. Saturday 17 December is Bradley’s 24th birthday, and there is an international call-out for support and solidarity actions on that day. Saturday 17 December: What’s On? FREE BRADLEY MANNING! END THE WARS! END THE PERSECUTION OF WHISTLE-BLOWERS EVERYWHERE! Demand that the US frees Bradley Manning and drops all charges against him. Action called by Veterans for Peace, London Catholic Worker and WISE Up for Bradley Manning. Free food and information stall with Cardiff Anarchist Black Cross and WISE Up for Bradley Manning from 1pm outside Central Market, by St John’s Church (may have to seek shelter if weather’s bad though). Come along to the stall and send a solidarity message to Bradley Manning. Bradley Manning’s Mum is Welsh and still lives in Pembrokeshire. Bradley Manning lived and went to school in Wales for three years as a teenager. There will be other autonomous actions for Bradley Manning taking place in and around Cardiff over the weekend. There will be something going on for Bradley Manning at Occupy LSX (St Paul’s) in London at 6pm on 17 December. It would be great if every Occupy site in the country marks the day in some way. This is a call-out for autonomous actions for Bradley Manning everywhere on 17 December. Use your imagination! A few ideas in this post. If you do something for Bradley Manning on 17 December or thereabouts, however small, don’t forget to send a report and/or photos to WISE Up for Bradley Manning. This entry was posted in Announcements, Manning and tagged Anarchist Black Cross, Bradley Manning, Britain, call-out, Catholic Worker, London, Occupy!, Pembrokeshire, solidarity, speakers, trial, US, Veterans for Peace, vigil, Wales, WISE Up. Bookmark the permalink. 1 Response to 17 December International Day of Action: What’s happening here?